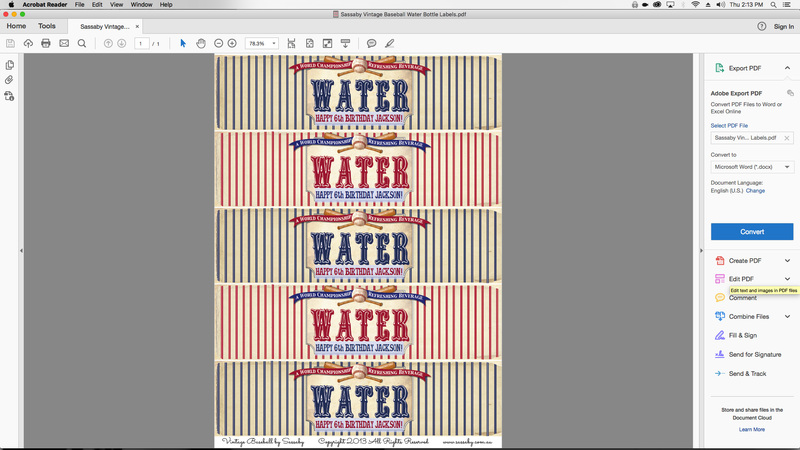 Water/Drink Bottle Label Instructions - The Sassaby Party Co. Thank you for purchasing a set of editable water/drink labels. ​Following the instructions either on your Download Page or in your Link Email, you must click the links to download your digital files. Regular paper: You can print your labels on regular bright white paper or cardstock, and attach them using double-sided sticky tape. If you wish you make your labels waterproof, see below. Waterproof paper: You can print your labels on waterproof paper, available at office supply stores. A cheaper waterproof option, is to print on regular paper, and attach the labels to your bottle using clear contact. Sticker paper: Our labels are NOT formatted to any particular size stickers or labels since we are an international seller. If you wish your labels to be stickers, we recommend using full sheet sticker paper, and cutting out the labels with scissors. When using Adobe Acrobat Reader you have the option to Print at Home, at your Local Print Store or by Uploading your Saved files to an Online Printing Service that accepts PDF files (see more below). If you need to send your edited digital files to a printer, we DO NOT recommend it. The edited text may not send correctly, and if the printer does not open the files using the latest version of Adobe Reader at the other end, the files will become corrupted, and will not be printable. Regular paper: Cut out and attach your labels using double-sided sticky tape. If you wish you make your labels waterproof, see below. Waterproof paper: If you have chosen to print your labels on waterproof paper, simply cut out the labels with scissors, and attach with double-sided sticky tape. If you have printed onto regular paper, cut out your labels with scissors, and attach to your bottles using clear contact. Sticker paper: If you have printed onto full sheet sticker paper, simply cut out your labels with scissors, and attach to your bottles.